1. any of the primary parts or constituents of a thing. 2. in chemistry, a simple substance that cannot be decomposed by ordinary chemical means; elements are the basic components of which all matter is composed. Chemical elements are made up of atoms, each of which consists of a nucleus with a cloud of negatively charged electrons revolving around it. The two major components of the nucleus are protons and neutrons. The number of protons in the atoms of a particular element is always the same, and therefore the physical and chemical properties of the element are always the same. It is possible, however, for a chemical element to exist in several different forms, the difference depending on the number of neutrons in the nucleus of its atoms. Different forms of the same element are called isotopes. There are at least 105 different chemical elements known. (See Appendix 6 for a list of the elements, and the symbol, atomic weight, and atomic number of each.) The atomic number of an element is determined by the number of protons in the nucleus of one of its atoms. The mass number of an isotope is determined by the total number of neutrons and protons in the nucleus. Stable Chemical Elements. A stable chemical element is one that contains an optimal ratio or range of ratios between the number of protons and neutrons in the nucleus. A stable element does not spontaneously transmute into another element and therefore does not give off radiation. The stable elements are those that have an atomic number below 84, except for a few, such as potassium and rubidium, which are weakly radioactive. As radioactive elements disintegrate and form new chemical elements, a tremendous amount of energy is released. This emission of energy and nuclear particles is called radiation. The radiations may be electrically charged particles having size and mass, such as alpha particles and beta particles, or they may be nonparticulate and contain no electrical charges, such as gamma rays. Most radioactive elements give off either alpha or beta particles and at the same time emit gamma radiation. formed e's of the blood the blood cells. 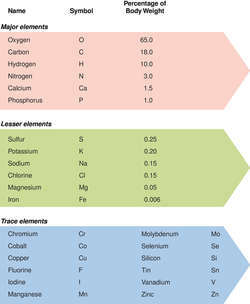 trace element a chemical element present or needed in extremely small amounts by plants and animals; such elements include manganese, copper, cobalt, zinc, and iron. 1. A substance composed of atoms of only one kind, that is, of identical atomic (proton) number, that therefore cannot be decomposed into two or more elements and that can lose its chemical properties only by union with some other element or by a nuclear reaction changing the proton number. 2. An indivisible structure or entity. 3. A functional entity, frequently exogenous, within a bacterium, such as an extrachromosomal element. 2. in chemistry, a simple substance that cannot be decomposed by chemical means and that is made up of atoms which are alike in their peripheral electronic configurations and so in their chemical properties and also in the number of protons in their nuclei, but which may differ in the number of neutrons in their nuclei and so in their mass number and in their radioactive properties. 3. in the philosophies underlying some complementary medicine systems, a member of a group of basic substances that give rise to everything that exists. 2. in ayurvedic tradition, the basic entities (earth, air, fire, water, and space) whose interaction gives rise to material existence. formed elements of the blood the blood cells. trace elements chemical elements distributed throughout the tissues in very small amounts and that are either essential in nutrition, as cobalt, copper, etc., or harmful, as selenium. one of more than 100 primary, simple substances that cannot be broken down by chemical means into any other substance. Each atom of any element contains a specific number of protons in the nucleus and an equal number of electrons outside the nucleus. In most elements, the nucleus may contain a variable number (high or low) of neutrons. An element with a disproportionate number of neutrons may be unstable, in which case the nucleus undergoes radioactive decay into a more stable element. See also atom, compound, molecule, radioactivity. In the context of a trial design, a basic unit of time within a clinical trial, which describes what is expected to happen to the subject (patient) during the period, when the period begins and rules for ending the element. A section of text in an XML document delineated by start and end tags, or, in the case of empty elements (elements with no content, only attributes), indicated by an empty tag. 1. A substance composed of atoms of only one kind, i.e., of identical atomic (proton) number, which therefore cannot be decomposed into two or more elements, and which can lose its chemical properties only by union with some other element or by a nuclear reaction changing the proton number. Oxygen, carbon, hydrogen, nitrogen, phosphorus, and sulfur are found in all living organisms. These six elements and calcium make up 99% of the human body mass. Sodium, potassium, magnesium, chlorine, iodine, and iron form 0.9% of the body mass. A nucleotide sequence that can be inserted successfully into several different places in the genome. One of a series of metallic elements that follow lanthanum (at. no. 57) in the periodic table of elements and that have oxides with similar properties. The series comprises the 14-element lanthanide series (at. nos. 58-71 and includes praseodymium, promethium, and ytterbium. An element needed by the body in very small amounts; many are essential for enzyme functioning. Trace elements include chromium, copper, fluoride, iodine, iron, manganese, molybdenum, selenium, and zinc. Any of those elements for which laboratory animals seem to have tiny dietary requirements, typically less than 1 µg/g. Elements in this category include arsenic, boron, bromine, cadmium, chromium, fluorine, lead, lithium, molybdenum, nickel, silicon, tin, and vanadium. a pure substance consisting of only one type of atom, that cannot be destroyed by normally available heat or electrical energy. n any substance that cannot be reduced into a less complex substance, all atoms of which are defined as having the same number of protons. Substance composed of atoms of only one kind that therefore cannot be decomposed into two or more elements and can lose its chemical properties only by union with another element or by nuclear reaction changing the proton number. n a simple substance that cannot be decomposed by chemical means and is made up of atoms that are alike in their peripheral electronic configuration and chemical properties but differ in their nuclei, atomic weights, and radioactive properties. 2. in chemistry, a simple substance that cannot be decomposed by ordinary chemical means; the basic 'stuff' of which all matter is composed. Chemical elements are made up of atoms. Each atom consists of a nucleus with a cloud of negatively charged particles (electrons) revolving around it. The two major components of the nucleus are protons and neutrons. The number of protons in the atoms of a particular element is always the same, and therefore the physical and chemical properties of the element are always the same. It is possible, however, for a chemical element to exist in several different forms, the difference depending on the number of neutrons in the nucleus of its atoms. Different forms of the same element are called isotopes. There are at least 105 different chemical elements known. Table 6 lists the elements, and the symbol, atomic weight and atomic number of each. The atomic number of an element is determined by the number of protons in the nucleus of an atom of the element. The mass number of an isotope is determined by the total number of neutrons and protons in the nucleus. a chemical element present or needed in extremely small amount by plants and animals, such as manganese, copper, cobalt, zinc, iron. See also trace element. To produce a single atom of element 110, the researchers used the UNILAC accelerator at GSI to bombard a target of lead over many days with more than a billion billion nickel atoms. Such activity can be attributed to the particular transuranic element being sought, and on this basis several claims have been made, including Dubna's claim to element 110, as related in the previously mentioned paper by Oganessian et al. The Gesellschaft fur Schwerionenforschung (GSI) in Darmstadt, West Germany, has the facilities for observing such alpha spectra, and, according to Paul Kienle of GSI, the Dubna report prompted GSI experimenters to start attempts to confirm element 110.